The Claudio Bressano farm is a family-driven farm, whose main activity is cultivating hazel nuts besides cultivating some vines for domestic use and raising Piemontese oxen, which are native to Piemonte. 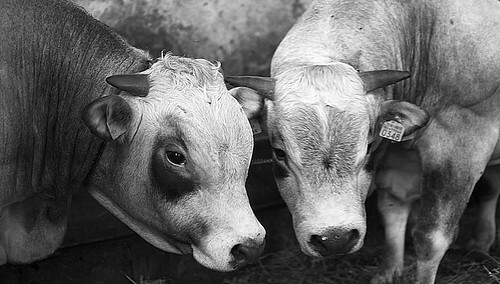 The passion for raising Piemontese oxen was passed on to Claudio from his father, a great expert on this subject. Claudio buys the best available calves, when they are weaned, from selected farms. When the animals arrive at his farm, they weigh about 200 kilogrammes, while they weigh about 600-700 kilgrammes after 20-25 months. The animals are only fed the best, available food. In fact, all the animal feed is cultivated at the farm in order to guarantee high quality meat only. Cultivating food for the animals, which are producing manure to be used as fertilizer on the farm gives a very tight cycle: hay obtained from meadow grass, maize, field beans and barley cultivated and milled at the farm, and everything being fertilized by a mix of manure and hay. Each ox had a yellow mark on one of its ears and I would like to know what they indicated since they seemed to contain more than just the typical cryptic numbers. Claudio patiently explained to me their meaning: the first symbols show the parents of the animal permitting a retrace of its genealogy, followed by a symbol indicating at which farm it was born, a serial number for a bovine register, last but not least, the name of the animal. In other words, this is a tiny livestock farming where man and animal stay in close contact with each other where the animals have first names like it was a big family. Claudio confided to us that he’s raising these animals because of his grand passion for doing it since it barely pays itself. In the past, raising livestock was an investment since in a year with a small harvest due to bad weather and consequently little food for man and animals, it was possible to sell the calves, but now life is different. In addition to breeding Piemontese oxen, they are also cultivating 2600 hazel nut trees, which as mentioned at the beginning, constitutes the main activity at this farm. After having harvested and dried the hazel nuts, they are sold to companies which use them as ingredients for confectionery and a diverse selection of foods. They are also cultivating Barbera and Dolcetto d’Alba vines for domestic use only.